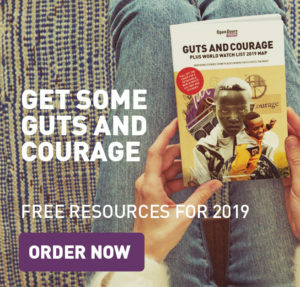 We love youth leaders, you’re all very special indeed, and here is a bunch of inspirational and challenging resources you can download, adapt and use with your youth group. We’d love to know what you think of these resources and find out what sort of things you’d find helpful for us to produce to engage better with your groups in the future so do get in touch. We’re also out and about visiting groups and churches quite a bit, so if you’d like to request a youth speaker at a youth event you organise, then do drop us a line. Prayer is the cornerstone of what we do at Open Doors. We’d love you to think about praying regularly for persecuted christians with your youth group. In places where the Bible is banned, followers of Jesus memorise it. 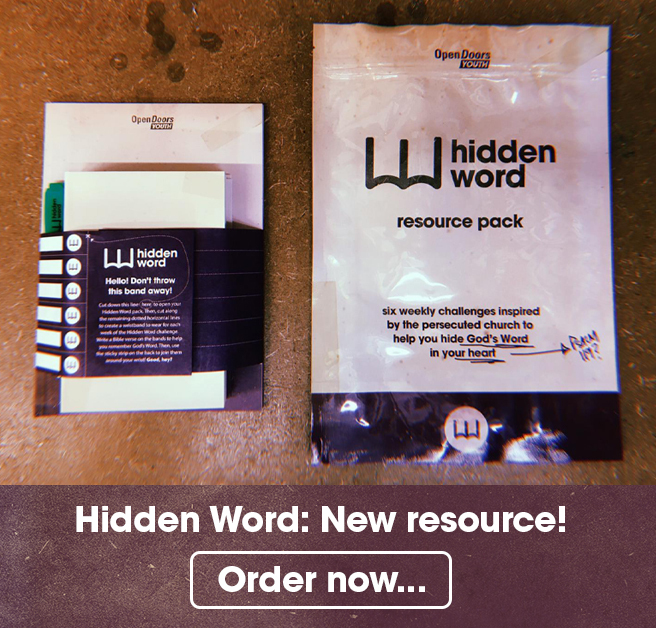 Hidden Word is a new resource to inspire young people to learn Scripture. The pack comes in a buriable bag, and includes six weeks of devotions and challenges, a leader’s guide, a ‘Hidden Word’ New Testament and Psalms, memorisation aides and a wealth of ideas, activities, stories and prayers. The pack is available for a £14 minimum donation (including UK postage), with discounts for 5 copies or more. The price for each pack includes the cost of sending a Bible to a persecuted Christian. We’ve created a few little presentations and talks with associated PowerPoints that you can download and use to give a talk on the persecuted church. Themes include ‘Guts and Courage’, ‘Pray With Them’ and ‘One Family’. Adapt and share as you see fit. We know that persecuted christians need our encouragement and support. As well as praying for them we can also write directly to them, sharing Bible verses and thoughts of encouragement. Running, walking, baking, swimming, cycling… you can do just about anything to raise money for your persecuted family in Iraq and Syria by doing the things you love. Get tips, stories and all the help you need with our free fundraising pack. Download it today! A group session and series of three reflections on the theme of family. Includes a standalone youth session resource with additional devotions for youth groups to take away! A free downloadable guide with four video based sessions including faces from Soul Survivor, Fusion and Summer Madness. Get your group thinking, discussing and praying about a radical relationship with God. Run an evening event with your group and focus prayer and discussion on the church in Syria. Hold a Secret Screening and base and evening of prayer and fundraising around our quality short film ‘The Cost’. Get a free downloadable pack, with resources to help you plan, advertise and run your Secret Screening below. A prayer, reflection and action resource inspired by the small steps taken by persecuted Christians around the world. Inspire your youth group to step up and step out in faith. Blackout is a sponsored fast. It’s a challenge to spend the weekend in silence, either by not speaking and/or by staying clear of social networks. We hold a Blackout weekend each spring and hundreds of youth groups and people take part, raising money and prayer for persecuted christians. Secret Church is a totally different way of doing church. Powerful, interactive, full of worship and faith, this is an experience that will help you to journey deeper into the world of the persecuted church. Find out more and run your own Secret Church service at the link below. The Cost is our little Open Doors Youth magazine. We mail it out around 3 times a year. You can view old editions at the link below and sign up to receive future mailings too. 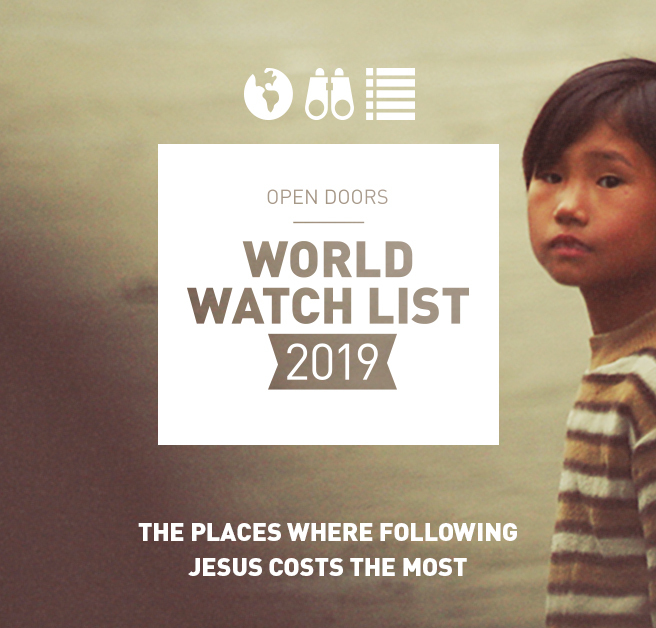 We produce quite a few videos and films to tell the stories of brave, courageous and inspiring christians who know the true cost of following Jesus. Here’s some of our faves – please do share them with your groups and use to generate discussion and prayer. Here’s some simple session plans that you can download and use to run a youth group session themed around the issue of persecution. Our summer 2014 campaign saw over 1000 people ‘Wake Up and Pray’ with us. Although the campaign has now long finished, you can still download the reflection guide and adapt the sessions to use as youth group sessions.